Principles of Taxation Law 2018 Taxation law can be an incredibly complex subject to absorb, particularly when time is limited. Written specifically for students, Principles of Taxation Law 2018 brings much needed clarity to this area of law. 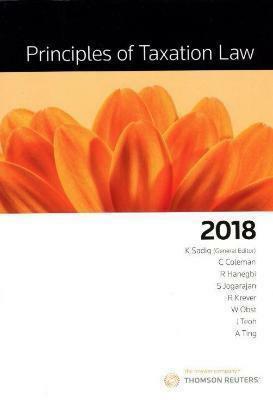 Utilising many methods to make this often daunting subject achievable, particular features of the 2018 edition include: seven parts: overview and structure, principles of income, deductions and offsets, timing issues, investment and business entities, tax avoidance and administration, and indirect taxes; clearly structured chapters within those parts grouped under helpful headings; flowcharts, diagrams and tables, end of chapter practice questions, and case summaries; an appendix containing all of the up to date and relevant rates; and the online self-testing component mentor, which provides questions for students of both business and law; Every major aspect of the Australian tax system is covered, with chapters on topics such as goods and services tax, superannuation, offsets, partnerships, capital gains tax, trusts, company tax, tax administration and state taxes. All chapters have been thoroughly revised. Principles of Taxation Law 2018 is the perfect tool to guide the reader from their initial exposure to the subject to success in taxation law exams.